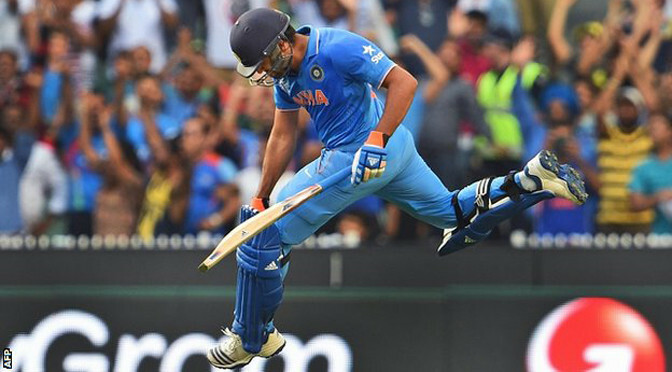 Defending champions India coasted into the World Cup semi-finals with a 109-run win over Bangladesh in Melbourne. Opener Rohit Sharma made a composed 137 from 126 balls and Suresh Raina 65 from 57 as India recovered from 115-3 to post 302-6 at a boisterous MCG. Bangladesh lost two wickets in the seventh over of their reply and eventually limped to 193 all out in 45 overs as India’s bowlers dominated. India meet either Australia or Pakistan in a Sydney semi-final on 26 March. They will go there on the back of 11 successive World Cup victories, a run that stretches back to their success on home soil four years ago. Their six-match winning streak in this competition has come after a horrible tour of Australia, where they failed to win any of their 10 games across all formats. But the resurgence in a limited-overs tournament is typical of MS Dhoni’s team, who not only hold the World Cup, but also the Champions Trophy and won the 2007 World Twenty20. India made the last four by outclassing a Bangladesh team that eliminated England on their way to a first World Cup quarter-final.